Good morning folks! My day in our fun blog hop...and we are off and running, lol. This has all been organized by Marian over at http://www.seamstobesew.com/...doesn't she do a great job for us? Now there are nice giveaways with our hop...so make sure you scoot over to Marian's page to get in on those!!!! My part in the hop is a table runner I made for today. I am nuts about many things, but my family comes first. This piece represents my husband, our sons, and our grandchildren. As you can see...one heart for each mentioned above..love them dearly. I found this runner on line, and it was so quick to put together. I just tweeked it a bit, and added the cut outs from the hearts. Thanks for being here today, and make sure you visit the rest of our list today, please. 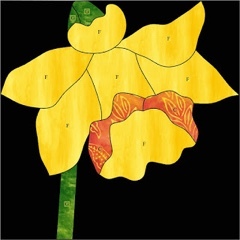 That is beautiful, Marjorie, and so lovely to show what you are nuts about. Your lovely runner is a great symbol/reminder of your family. Your runner is so sweet and beautiful! I love how it represents your family! A lovely table runner, perfect for February! Very cute runner! Nice job! The table runner looks gorgeous! That's a lovely addition to your table! Really sweet! Love those swirly hearts! Great job on your runner. Beautiful runner, I like how you used the inner parts as well. That table runner is just perfect for this time of year. Love what you did to the hearts. 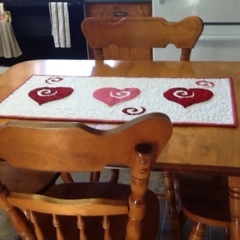 I like your table runner and the meaning of the hearts. Nice story. Hearts are always a wonderful expression of love. Great job on the runner. I know the quilting is fantastic!! 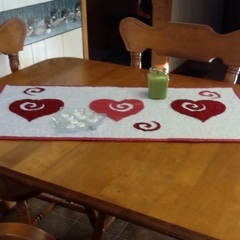 Cute idea for a Valentine's table runner. Thanks! Love the runner. Thank you for sharing. i love your runner. it is wonderful. especially the part of who it stands for. What a sweet idea, I'm assuming the swirly cutouts are the grandchildren. Perfect display of love in your family. Lovely runner. Thanks for the ideas. What a gorgeous table runner! I was wondering where you found it on-line. Lovely work! I Love Seasonal Table Runners! Your Heart Runner Is Adorable and Meaningful! I love your table runner. I especially like the cut-outs in the hearts carried over to the background of the runner! Thanks for sharing! Very pretty and festive. I like that one heart is a different shade. Your runner has such a special meaning. Love that runner and that swirl heart is one I want to try! I love those spiral cut-outs and how you made your piece so personal. Super cute! I love having table runners to change with the seasons and/or holidays. Very pretty! I love the swirls and would have liked to see a closeup of your beautiful creation! I love anything with hearts on it. Thanks for sharing. Love the runner - especially how you personalized it to represent your family! A great idea - think I'll steal it! Lovely runner, I wish I could see the quilting. This would be wonderful as a Valentines gift, thanks for sharing!! Such a sweet table runner! I'd like to make one just like it, only a bit longer. I'd be interested to know where you found the pattern online! There's nothing better than being nutty about our family. What a cute way to represent that love with the sweet table runner. Very nice runner! I love how you used the cutouts to represent your grandchildren. They are definitely a piece of our heart! I like the swirls in the hearts. Cute tablerunner. I love the swirls but I especially love the representation and ties to family. Such a wonderful way to remind everyone that they are loved. Loved the swirls. I love when a quilt or project is representational or metaphorical. What a lovely way to create a memory for the people you love. What a beautiful way to express your love. Those cutouts really make it special. Your tablerunner is beautiful and so nice with the hearts for them you love. Lovely table runner. I really like the extra swirl cut outs. Ooh!! I like the swirls! I haven't seen those on any projects this year ! Sweet runner Marjorie, just perfect for this time of year too! I sure do love your runner! Great to be hopping with you! Pretty table runner. Thank you for sharing. Your table runner is very lovely.